The "best Stand Up Paddleboards" specific for Women. We built our company around this amazing SUP. 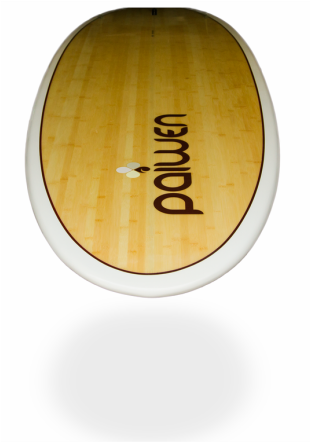 Length 10', Width 32", Thickness 4.5"
Is this board fit for YOU? Are you a beginner 60 to 185 lbs - Yes you will love it! Are you an intermediate up to 205 lbs - Yes you will love it! Are you advanced up to 220 lbs - Yes you will love it! wooden stringer down the center. Real bamboo veneers on the top and bottom. 2 layers of 6oz epoxy/fiberglass on top. 2 layers 6oz epoxy/fiberglass on the bottom. 4 layers epoxy/fiberglass on the rails, tip & tail. Re-enforced deck where you stand. 1x2: Ultra-strong, light, fiberglass, removable vanilla fins. Conveniently carry your board with this built in scoop handle. Attach your included ankle leash to this plug to tether your board to yourself. This is especially good for surfing and windy days, so your board won't get away from you. This valve is for releasing internal board pressure. A must for all "Stand up Paddleboards". Perfect length/width radio, keeping a good volume. Long standing zone for stable foot movements. Narrow tail for easy turning. Diamond tail: better for streaming water and keeping speed. Important on wide boards. Vee from tail up to 2/3 of the board: When it's choppy it is more comfortable and increases the speed in all types of water. And; for surfing, it is easier to turn the board from rail to rail. Back rocker is kept small: for keeping speed on flat water. The tail curve is important so water streams may leave the board more easily. The scoop/rocker is important near the nose: it makes for a more comfortable take-off when surfing. The thickness is progressive from the tail to the center. Thin nose: Keeps overall weight down and it is much nicer for cutting through water. First 1/3 of the board: the rails are rounded, keeping volume on sides of the board for stability and to help initiate a turn in waves. Last 1/3 of the board has thin rails: This part of the board meets the water when you are surfing so it is easier to intiate a turn when it penetrates the water. The other reason is, to prevent wind from pushing the board around when trekking. Nose has Renaud's signature 40/60 ratio. Renaud has been shaping for 22 years. He has a background in industrial and commercial computer engineering, studying at François Rabelais University in France until the age of 20. He later completed an additional 2 years in metrological engineering. His interest in shaping evolved along side his education, and he completed his first shape when he was 16 years old. His interests include Stand Up Paddleboarding, surfing, longboarding, kitesurfing, and windsurfing. As a shaper, he says it's good to practice a lot of aquatic activities because it helps him to understand how each board shape interacts with the water.